Copernicus. Galileo. Hubble. For ages, humans have looked up at the night sky to ponder the secrets of the universe. The flickering stars have been the stuff of fascination and research for millennia, from men and women who mostly turned their gaze ever upward to study the vastness of space. Yet today, a group of University of Notre Dame astrophysicists is going down — way down — in a new attempt to gain an understanding of the evolution of stars. 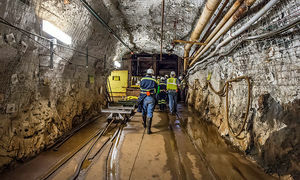 SURF is located in the former Homestake Gold Mine, which operated for more than a century extracting ore from hundreds of miles of tunnels, thousands of feet below the earth’s surface. That depth is key to projects like CASPAR. With a keen sense of the irony at play, Robertson explains that researchers must “reproduce the stellar environment” by getting as far away from that environment as possible to reduce the cosmic radiation that constantly bombards the earth and creates “noise” which interferes with sensitive physics experiments. It’s a fairly direct rationale for a project that took a winding path to fruition.